The Guerrilla Gourmet: Project Food Blog Challenge #1: Ready, Set, Blog! It seems like there are three kinds of food bloggers. The fabulous gourmet like Salty Seattle, who all seem to ask "how can I convince my guests that Mario Batali is on speed dial (or even chained to my stove! )", the valiant mom like $5 Dinners who all seem to wonder "how can I feed my hungry brood and have something left over for me? ", and the hungry activists like those at Ethicurean who appear to always ask "how can I make every dish a weapon in the battle against global warming?" As budding cooks and eaters we surfed the blogosphere and sampled a little from each of these styles, collecting tips, recipes and inspiration on the way, but we always felt hungry for more. Chasing the next big thing was more work than it was worth. Coupon cutting and bulk buying crowded our freezer with processed dinners, left uneaten. Dishes that delighted our eyes and our mouths left a hole in the ozone layer (not to mention our bank account). Guerrilla Gourmet, The: -noun 1. the collective works of Eric and Tiffany Schaefer pertaining to revolutionary, refined cooking that is at the same time, radically cheap. And so we began to see not three separate questions, but inseparable parts of the one most important question: "What's for dinner?" And in all of our surfing and searching we had found no one with quite the same idea, so we took action and the Guerrilla Gourmet was born. 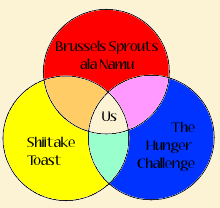 We believe that it is our unique approach, quirky wit and mulish determination that will help us get at least to the second challenge round, and hopefully to win the Project Food Blog Challenge. However, we know the competition will be fierce (and inspiring), so we can't wait to see what everyone does! 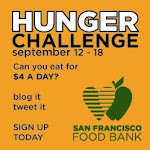 And finally, we were a little late getting this up and posted in part because of the other challenge we're undertaking: the San Francisco Food Bank Hunger Challenge. This will be our second year trying to eat well on the average U.S. food stamp allowance of only $4 per person per day. You can read more about the challenge here, and see our work from 2009 and from 2010. We hope you'll consider taking on the challenge with us next year. Above and beyond, the foodie community has shown that together we are stronger than any challenge out there. Good luck everyone! 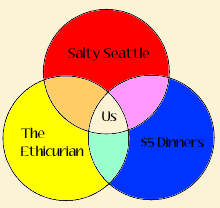 I'm a sucker for venn diagrams! ;) You got my vote! Great job on this challenge. Cheers and aloha. Good luck on the challenge! Love the blog and your concept. I'm all about eating great on the cheap and helping other people do the same! I look forward to learning some tips from your blog! Great post. You have one of my votes. Best of luck in the competition. This is such a cute and telling post. Can't wait to see what's coming up next, so I voted for you.